In an effort to make lunchtimes more active and enjoyable for our pupils on the school yard, and to ensure that all children have an opportunity to be meaningfully engaged at lunchtime, we set up our “Friendship Squad”. It is now an established part of school life and is a great source of enjoyment for our children. Our 5th class pupils have the opportunity to be involved in the day-to-day running of the squad, with the 5th class teacher overseeing the management of it. The children apply for a position on the squad and proceed to get involved in some training from the Principal and class teacher. 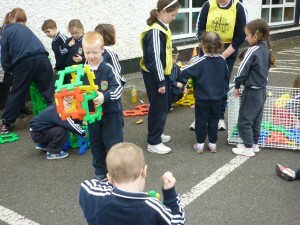 We have a wonderful selection of activities and outdoor equipment, which rotates around our different playground areas. The 5th class pupils wear special yellow bibs which are easily identifiable and they watch out for any child who may feel lonely on a particular day, or be in need of company. We are particularly proud of our friendship squad and its positive impact on playtimes in our school and are delighted that other schools have come to visit us to see our Friendship Squad in operation!